Diva #201 – "Moebius Syndrome Awareness Day 2015"
This week, I learned a lot about a lot of things, and it’s only Monday! Laura Harms, The Diva, has a couple of really cute kids. The youngest, Artoo, has a neurological disorder called Moebius Syndrome. This coming Saturday is Moebius Syndrome Awareness Day, so she her prompt for this week’s Diva Challenge was to use the Moebius Syndrome logo in our work. 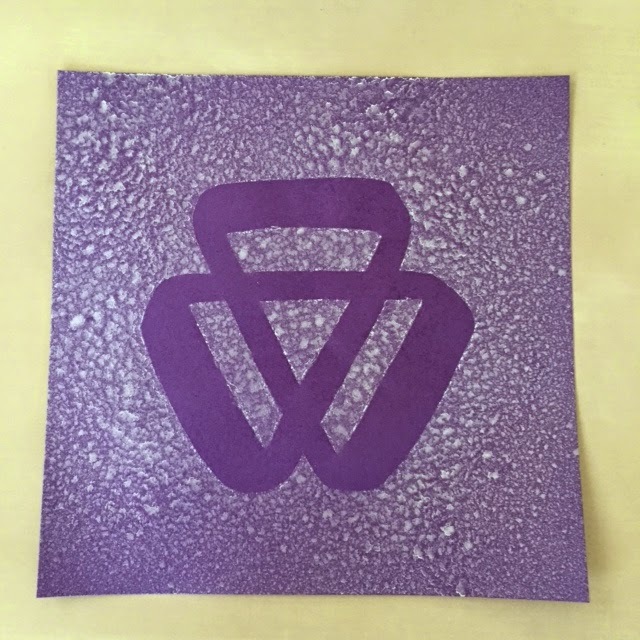 So…I printed it out…made it the right size for my 6 x 6 paper, cut it out, grabbed a piece of purple paper (the color they use for the Moebius Syndrome stuff) and did a little paper treatment. Paper curled with the spray…ack…I ironed it…it flattened. Then I went to tangle on it. Alcohol ink Perfect Pearls Mist and Micon pens do not work well together. I did most of this in White Gelly Roll, but I wanted some black to accent it. Permawriter…no…IdentiPen…no joy…Black Gelly…worked for a minute…Black Gelly Glaze…worked, but boy was it inky! Interesting, to say the least. So…this post will get a little weird. I thought I would collect up some of the Diva Challenges as I finish the one ones I am behind, and just post them all on one page so I can sort them out. I will do this from time to time! The first here is Diva #199, which is a UMT (Use My Tangle) of Hitch by HeidiSue. 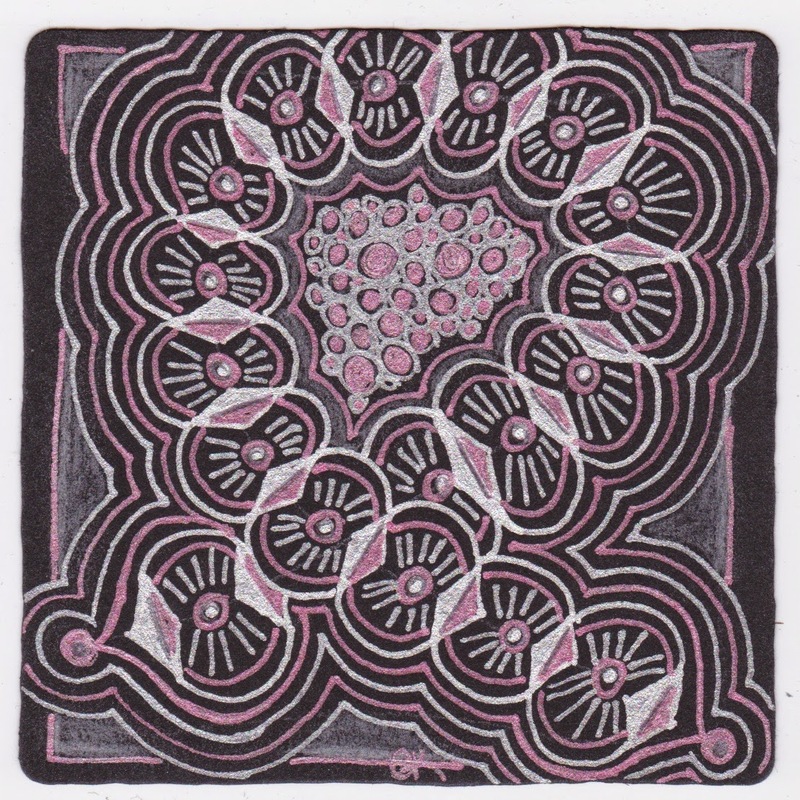 On a Black Tile, with metallic Gelly Roll pen. Not completely happy with the red, it looks more pink on the black, and not quite as dramatic as I would have like. 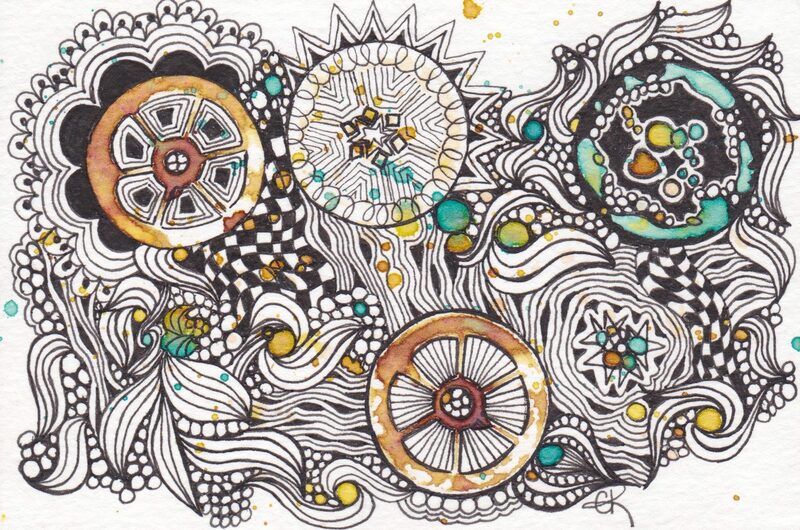 And also, #197, which used the new Zentangle pattern Akuras. 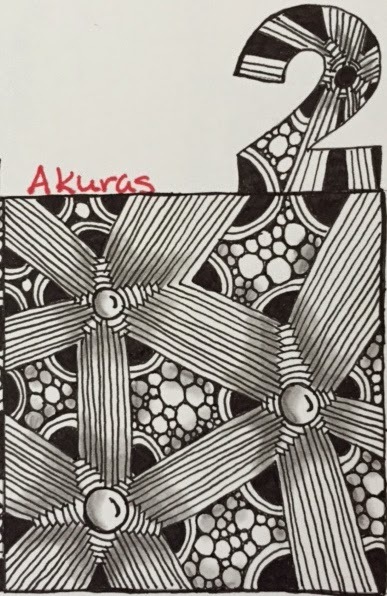 I feel like I cheated on this a bit, because I am going A-Z on Official tangle patterns in my Tangle-A-Day 2015 calendar, and it so happens I am catching up on that too. And last, but not least…I saw this on Pinterest, so I had to have it for my work space. 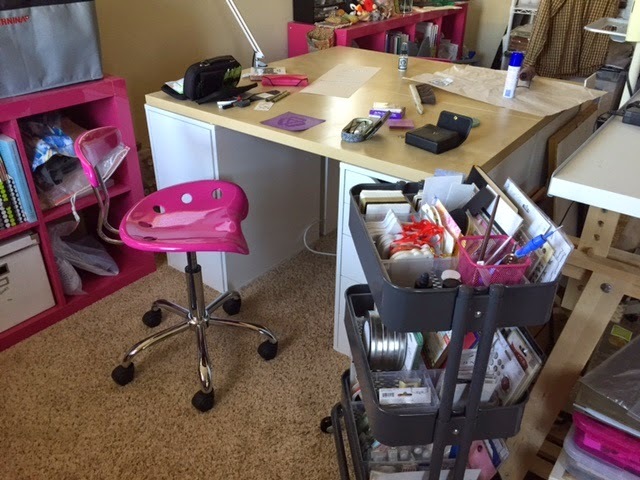 I have been moving stuff from space to space to work, sometimes at the tall drafting table, sometimes at my desk with my computer, and sometimes at the sewing table (since I have the machine put up for now…long story…school is involved.) 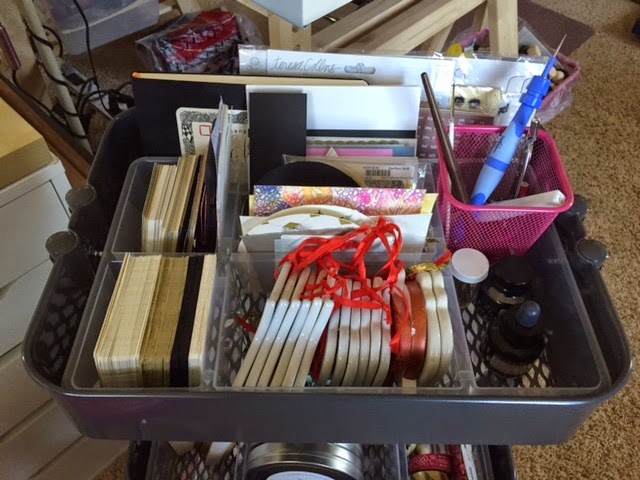 I set up my most used Zentangle materials in the top rack, including stuff I am currently working on. So now I can just wheel it around, and work where I want. ‹ PreviousViva La Diva 200! 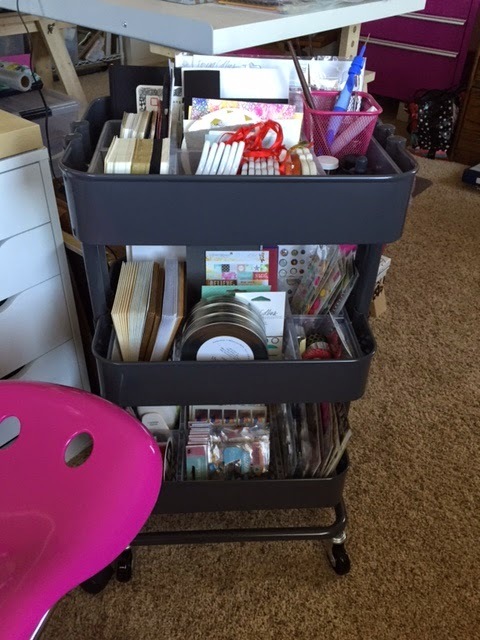 I think my husband would be thrilled if I had a cart like that for my Zentangle stuff. He mentioned this weekend that I'm kind of spread out all over the coffee table. Wow. That was quite a process you undertook for your moebius tile. Thanks for sharing the others too. They're beautiful. Loving the dramatic white on purple mobius tile! wow! the shading is stunning. Your Moebius-tile looks wonderful! I said 'wow' when I saw the plain one, and then I saw you used it to tangle on. I really love it! Absolutely wonderful your Möbius-tile! So lovely idea! Your tile is gorgeous and your craft cart makes me jealous! 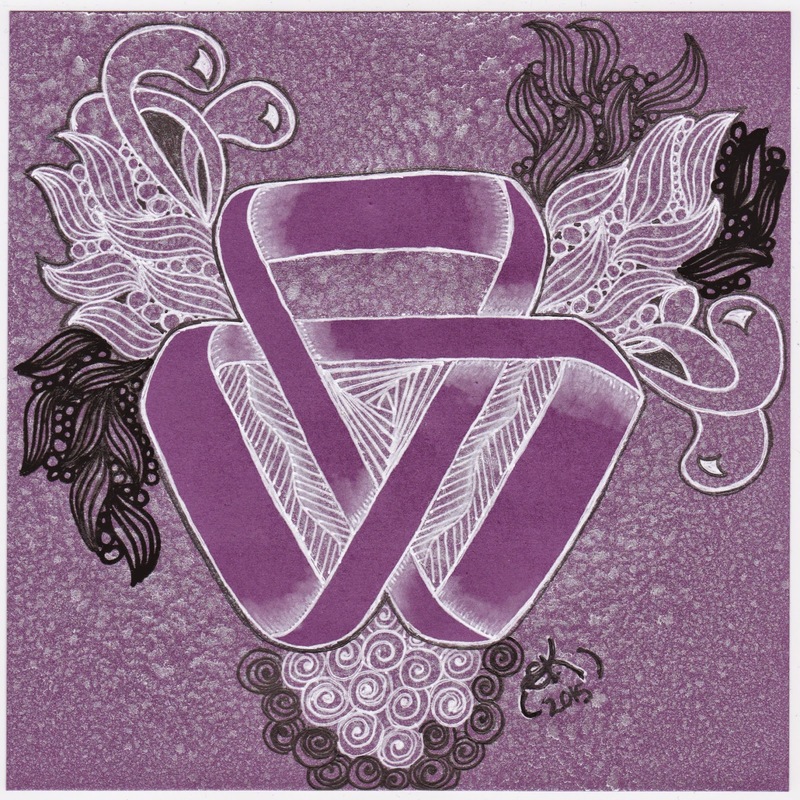 Like your Moebius Syndrome Awareness tile. The white on the purple really stands out. Did you use a chalk pencil or a Zentstone for the shading in white? Thanks! The cart is from Ikea! I used the Generals Chalk Pastel pencil…thank you so much! WOW, this challenge tile is absolutely gorgeous, Charlotte. I love it. You have done so well choosing these color and tangles. Yes, it's sometimes extremely hard to draw on colored paper and it takes a lot of patience. I really like the mauve colored moebius! That looks like it took a lot of time and planning….the white and black highlights really added to the great effect. Your tiles are pretty. The Moebius tile is gorgeous. Love the cart. I do a lot on colored paper, but I think most of the problem came from the paint I used. I am learning a lot about different paint types these days. Thank you so much. I think it took me longer to cut out the stencil and wait for the paint to dry than anything else. And the frustration with the pens…lol…that was trying! Love the stenciled Moebius. I wouldn't have known you had trouble with the ink if you hadn't said so. It looks great! Copic multiliners may work as copics are alcohol and they are geared to work with that. I've been eyeing that Ikea cart for awhile. Nice! The background for Arukas is great! A wonderful Post, CharKat. You are such a creative artist. Love all of your Tiles. The Mobius Tile turned out just terrific. Love the Mooka's and your wonderful reflections. Beautiful line work on all of the Tiles. Thanks for the photos of your Equipment Cart.